Two Toronto lawyers say it's time to retire the Lady Barristers robing room at Osgoode Hall in favour of a larger communal space that all lawyers using the Queen Street West courthouse could access. Two Toronto lawyers say it's time to retire the Lady Barristers robing room at Osgoode Hall in favour of a larger communal space that all lawyers using the courthouse on Queen Street West could access. One of them says the sign itself, a relic from an earlier age, could be auctioned off, with the money going to support a scholarship for women in the legal profession. A change.org petition, which calls for a unisex robing room at the historic building at 130 Queen St. W., had already garnered more than 500 signatures by midmorning Tuesday. Osgoode Hall houses the Ontario Court of Appeal, the Divisional Court of the Superior Court of Justice and Law Society of Upper Canada offices. 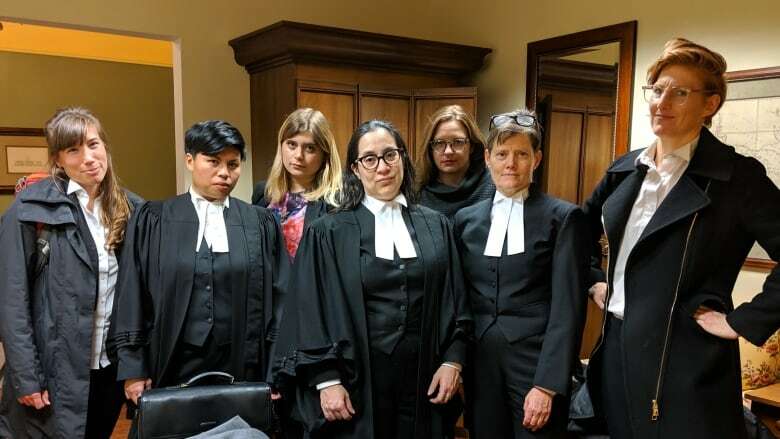 Fay Faraday and Breanna Needham told CBC Radio's Metro Morning that Osgoode Hall has change rooms for male and female lawyers, but the one for men is spacious and has about 70 lockers, while the one for women is small and has only 12 lockers. "I have been doing this for over a quarter of century and every time I go into court, I have to walk by that ridiculous sign for the Lady Barristers room, which, as I said in my post, is so two centuries ago. And it's tiny," said Faraday, a lawyer at Faraday Law who has commented on the robing room on Twitter. Faraday said the robing rooms, with lockers for clothing storage, do more than just provide space for lawyers to change into legal robes before appearing in court; they also allow them to interact with each other. "I know about the disparity between the accommodations that we have and that the male lawyers have," said Faraday. "But it's not just about the space in which to change. It's that the room, the robing room, is where lawyers, where they meet each other, where they strategize for cases, where they network, where there's mentoring that happens." In the change room for women, she said: "You get in there and you get out as quickly you as can because it's so small." Faraday said the disparity is glaring and an example of the inequality faced by women in the legal profession. She described the Lady Barristers room as "quaint" and "tiny." A 2015 article by Canadian Lawyer magazine described the change room for men as "opulent" with the feel of "a male locker room in an old-money golf and country club." It also reportedly has tables and chairs. The change room for women has one small couch and a couple of benches that look like they are from a pool change room. If seven lawyers stand in the room, they would take up 50 per cent of the space. Faraday said it's significant she and other lawyers have fought for women's rights in cases at Osgoode Hall, but still have to fight for equality in the building itself. "If we're in there, fighting for equality for our clients, but it is visible that we, as the most privileged women, are still treated as second-class citizens, that sends a signal about how seriously we take equality in our justice system," she said. "The issues that I fight for my clients are much more serious than this and we are the most privileged women, but we are still treated like second-class citizens, and that has got to change." Needham, who launched the petition and practises at Lax O'Sullivan Lisus Gottlieb, said she wanted to do something about the issue, which is talked about in private all the time. "These robing rooms, they're just not inclusive. They don't recognize the practice of litigation as it exists today. It's not just about men versus women," she said. "It's about availability of this crucial space for informal networking and mentoring to all lawyers, regardless of their faith, background, whether they are men, women, non-binary individuals, LGBTQ+. We should all be able to engage in that. And that disparity starts early," she said. Needham said that ideally, the communal space would have private stalls where lawyers could change their clothes, but would also have a lounge, a working area and be accessible to all lawyers. The petition notes women and men make up roughly equal numbers in the legal profession. "Women in law account for approximately 50% of practicing lawyers in Ontario — there is no basis upon which they should be allocated this much less than the men in anything in the profession, let alone space," it reads. "We appreciate the concerns outlined in the petition about the women's robing room at Osgoode Hall and we are looking into options. We'll provide an update as soon as we are able."